The Colorado River is the largest river entirely within the state of Texas. In a typical year, almost 600 billion gallons (1,840,491 ac-ft) flow through the Colorado’s 900-mile course from its source in the Texas Panhandle to Matagorda Bay where it flows into the Gulf of Mexico. The river’s drainage basin spans more than 42,000 square miles — about 16 percent of the total area of Texas. Austin, the state capital, is the largest city in the basin. Management of the river is divided into the Upper and Lower Colorado River basins. This description of the Colorado River near Hornsby Bend relates the river as experienced by two Franciscan priests looking for Tejas Indians. The region was to become know as the El Monte Grande [Big Thicket] — a large, almost impenetrable bottomland riparian forest. Like most rivers in Texas in the 1700’s, the river habitat was thick, difficult to travel through, composed of briars and grape vines, and inhabited by bears. Early accounts of the Colorado River system indicate that the water quality was “the best we have found” in the region. Though we will never return to the El Monte Grande we have the opportunity to manage the Colorado River system in a manner that restores the luxuriant forest and provides the clear, fishable, swimable water that once again attract people to the river and to the region. The rivers, streams, aquifers and land resources of the basin and bay system are the lifeblood or Central Texas. The upper reaches the river are impounded by three reservoirs. The lower Colorado River flows through the Highland Lake region where it is impounded by six additional dams. Below Longhorn Dam, located in Austin, the lower 300 miles of the river is un-impounded as it flows through the cities of Bastrop, La Grange, Columbus, Wharton, and Bay City before entering the bay. Though “free-flowing” below Longhorn Dam, flow through this portion of the river is affected by the Highland Lakes, and specifically regulated by Buchanan and Mansfield Dams. Like many rivers in this country, water quality in the Colorado has greatly improved over the last few decades but has not been returned to pre-urbanization standards. Management of the flow regime of the river to provide for hydroelectric power, irrigation, cattle, and flood control have resulted in a river that is respected for the quantity of water managed, but not yet for the quality of experience it provides to surrounding communities and wildlife. Though this portion is relatively un-developed and free from urbanization, it also reflects the urbanization that has taken place upstream (Austin metro-area) and the impact of cattle grazing along the shores and down to the water’s edge. The riparian habitat is good for the most part; cottonwood, sycamore, black willow, cypress and elm, with dense undercover and grape vines (the bears are gone). Water quality is good from a chemistry viewpoint … meeting most state standards for the segments (set in the 1990’s). Flow is good most of the year (except for the winter months), as is fishing and birding (there are bald eagles along this stretch). Water clarity is marginal; fish and plants cannot be seen below a few inches and one is not enticed to jump in and swim like in the San Marcos and Guadalupe rivers south of Austin. Personal accounts of the river from locals indicate that the Colorado River used to run clear and was very desirable. Bank erosion in some portions has resulted in high, cut-away banks with little or no vegetation. 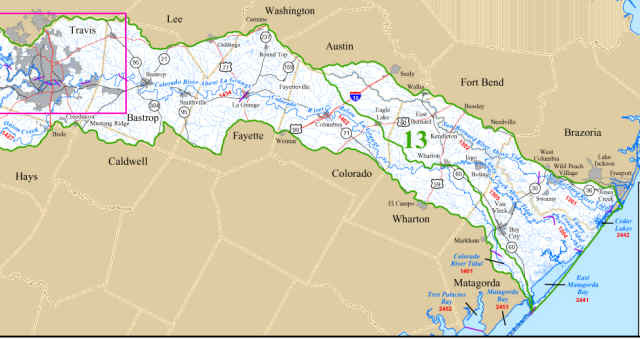 Austin-Bastrop-Smithville-La Grange River Corridor – The primary area of interest as a RiverSteward segment is the 110 mile free-flowing section from Longhorn Dam to south of La Grange, Texas. This segment, located immediately below Austin in Travis County, flows through Bastrop County and Fayette Counties. The upper section is primarily influenced by water flow controlled by the series of Highland Lakes located upstream. There is usually a sufficient flow of water in the river for recreational and aquatic life uses. The river is wide and slow-moving with a few rapids. Vegetation along the banks consists of elm, willow, and sycamore; while the riverbed contains various aquatic plants which provide cover for many fishes. The flood plain is flat, and limestone outcroppings are not as abundant as they are above the Highland Lakes. Several earthen cut-banks are exposed throughout this section. The river bottom is composed of sand and gravel, with sand and gravel bars and islands providing suitable areas for camping. In the Bastrop – Smithville segment, the Lost Pines, a section of pines that have become isolated from the East Texas piney woods, are found along the river in several places though the pines are seldom visible since they are not riparian vegitation. Sand and gravel compose the river bottom and sand and gravel bars appear frequently. The river, along this section, is extremely wide, and water flow is consistent, but slow. There are no difficult rapids or hazardous places on this entire section, although a few minor rapids are found. The banks of the Colorado gradually steepen as the river moves downstream. The flood plain deepens and the steep banks become extremely scenic with high sandstone bluffs and cliffs, along with several islands and sand bars which are often utilized for camping and day use. Classified Stream Segments – This segment of the Colorado River is divided into two state classified stream segments. The Colorado River downstream of Town Lake in Austin is Water Quality Classified Stream Segment 1428. The segment extends from Longhorn Dam to just upstream of FM 969 near Utley in Bastrop County. The Colorado River downstream of Segment 1428 to La Grange is Water Quality Classified Stream Segment 1434. These two segments are designated for contact recreation, exceptional aquatic life, and as a public water supply. These segments have habitat characteristics that are outstanding for their natural variability, an exceptional or unusual species assemblage, an abundance of sensitive species, exceptionally high species diversity and richness, and a balanced trophic structure. The “exceptional aquatic life” designation requires that the segment meet the highest standards for temperature, pH, dissolved oxygen, chlorides, sulfate, total dissolved solids, and bacteria. The Colorado River throughout this segment has been identified by the TPWD as an ecologically significant stream segment due to the presence of the state threatened blue sucker and the stream segment’s overall use (TPWD 1999a). Three tributaries, Gilleland, Cedar, and Gazley Creeks, have “high aquatic life” designations which require that the segment meet high standards for temperature, pH, dissolved oxygen, chlorides, sulfate, total dissolved solids, and bacteria. These segments have habitat characteristics that are highly diverse in their natural variability, an unusual association of regionally expected species assemblage, the presence of sensitive species, high species diversity and richness, and a balanced to imbalanced trophic structure. One tributary, Gilleland Creek, is currently being reviewed establish Total Maximum Daily Loads (TMDL) for bacteria due to ongoing violations of the bacteria levels relative to its designation for recreational use. This segment is in the upper end of the RiverSteward segment. 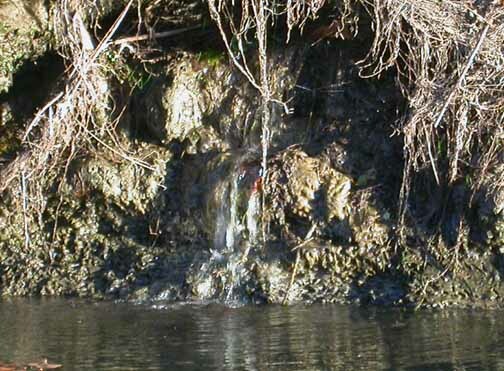 Onion Creek and Slaughter Creek (a tributary to Onion Creek) are listed as impaired due to low dissolved oxygen in Onion Creek and impaired macrobenthos community in Slaughter Creek. Additional data and information will be collected before a TMDL is scheduled. Both of these segments are in the upper end of the RiverSteward segment. Studies have been conducted downstream of the City of Austin to determine minimum stream flow needs to maintain water quality and fish habitat in the river (Environmental Flow). The study results were incorporated into the Lower Colorado River Authority’s (LCRA) Water Management Plan, as were the results of a study on the freshwater inflow requirements of Matagorda Bay (LCRA 1998: 2006) Though these flow regimes are likely inadequate to meet the needs of the biological communities of the river and estuary (per more recent studies), they provide a base flows to protect the river for now. Most of the natural discharge from the Carrizo-Wilcox aquifer in the study area ultimately flows to the region’s rivers and streams (Kier and Larson 1998). River bottomlands act as groundwater discharge areas, and groundwater provides varying amounts of base flow to the Brazos, Colorado, and Guadalupe rivers. Under the modeling scenarios used by Dutton (1999), streams in the study area go from gaining to losing with regard to groundwater. The calculations show a net gain by the streams of approximately 26,000 acre-feet in 1996 to a loss in year 2050 of approximately 30,000 acre-feet. This represents a net change of approximately 56,000 acre-feet per year of surface water from current conditions. The loss of this contributing flow would affect the hydrology and biology of large and small streams in the study area (Springs and Aquifers). La Grange to Matagorda Bay River Corridor – approximately 220 miles. This section of the Colorado River contains a number of unique points of interest. Several large cliffs exist along this section, and many springs lined with ferns issue from these formations. The presence of petrified logs in some of the limestone cliffs has been reported and fossils have been discovered in some of the cut banks along the river. The river itself is a slow, meandering stream that is quite scenic with heavy vegetation lining the banks. Numerous sand bars are available which often lend themselves to camping and day use. There are a few areas containing swift water and minor rapids, but no hazardous places exist. From La Grange to the Gulf of Mexico is a slow-moving, scenic coastal river. The river is wide, deep, and plenty of water for recreational use is available at all times. There are no hazards but occasional strong headwinds from the south often hinder recreational use of this stretch. Numerous hardwood trees line steep banks and large sand bars are found, which lend themselves to camping and day use. Access Points & Water Clarity are Limiting: The Lower Colorado River is a beautiful resource that is under-utilized for recreation and aesthetic enjoyment. Two key impediments are the limited number of access points and turbidity. Because 95% of Texas land is in private ownership, access points are few and far between. The distance between access points for canoeing and floating the river is often 25 miles or more. Use of public access points therefore need to be optimized and new access points secured. The water is clean but not inviting for swimming the way it once was. Water quality needs to improve such that people on the river want to get in the river.